I have written and trimmed this review many times and still worry if I have managed to convey the essence of this book. For this is more than a book and it has several layers. One, it has some disturbing history behind it. 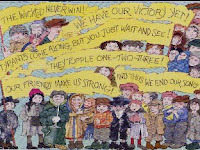 It' s based on a Czech opera of the same name staged in 1938 by the children of Terezin - a Nazi concentration camp disguised by the Reich as a retirement community. Chillingly, most of the performers of the opera (including the children and the composer) were later exterminated in Auschwitz. But that's the history behind the book that only the adult knows. To the child's eye it is a quirky tale of a poor girl and boy, Aninku and Pepicek. Their father died when they were babies and now their mother is ill. To make her feel better, the doctor says that they need to get her milk. They run to the town square looking for the milkman. Along the way they meet an icecream seller (with icecreams coming out of his feet, mouth and hands), a jolly looking baker, and finally the milkman, all singing funny little rhyming songs. And that's when they see Brundibar. A Hitler lookalike performer (Organ Grinder) singing an Awful! Awful! Awful! song. But all the adults threw money at him and shouted "Bravo Brundibar!" Stuff 'em in a burlap sack! The children get so scared they run and hide in an alley. Now what happens? How do the children get milk for their mother? How do they beat Brundibar? Help comes in the form of a talking cat, bird and dog. The sagacious dog tells them - "What to do? What to do when you are few? Ask for help, get more of you!" And thus it is, that 300 school kids come to help Aninku and Pepicek beat Brundibar. All of them are holding banners such as "We don't mind skipping school" and "People are happy helping It's never hard to find help, it is only hard to know that it's time to ask" and "Milk for Mommy! Bullies must be defied!" And so TrampTrampTramp march the 302 (don't forget Aninku and Pepicek) children, a cat, a bird, and a dog to the Town Square. The other adults finally notice the children and ask them to sing. And pour money on them when they finish. The children rush to the milkman, buy milk and go home to their mother. And they have a message for us "Remember Please be brave and Bullies will behave!" And so do the other cast of characters for they hold banners that say "The Wicked never Win!" "Tyrants come along, but you just wait and see! They topple one-two-three!" and so on. It's easy to see why this book was selected for the New York Times Best Illustrated Awards. It is after all illustrated by THE Maurice Sendak and is simply mind boggling. One doesn't know where to look and how many details to absorb. Every time we open the book we find new details we didn't see before. There are a lot of references to the Nazi era in the illustrations but without annotations I doubt if I'd find all of them. The prose is no less fun. Author Tony Kushner is a Pulitzer and Tony Award winner and has created a quirky, zany text that is not overshadowed by the brilliant artwork. A book that has a simple message for a child, illustrations with subtexts for the adults and quirky rhymes that can be sung to made up tunes by both (there are some 7 songs in the book - it is an opera after all). I wonder still - have I conveyed the essence of this book? Yes, you have! I love Maurice Sendak! What a deep multi-layered book! What a profound message, "Be brave and bullies will behave", applies to adults and kids alike! Thanks Starry/Art. I found this steal of a book for 100/- in Blossoms. Grabbed it and biiled it like a secret agent - furtively. You guys can borrow it if you want! WOW ! What a layered book .... as you have hinted, the history behind the story is hard to ignore for adults ... it is quite disturbing. But the message it gives out to children is truly remarkable. Maurice Sendak is much admired here. First, we were enchanted by the Little Bear books that he has illustrated. Then we found his trilogy- which includes "Where the wild things are", "In the night kitchen" and "Outside, over there." 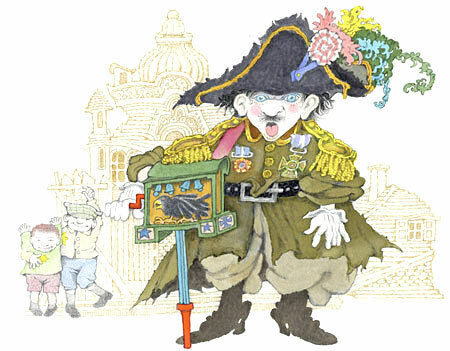 We have much enjoyed them as picture books, with his trademark illustrations. But just like the book you have featured here, they all have a deeper, sinister meaning, which I have not yet dared to visit with A.
Brundibar will be a valuable addition to this bunch of books, for many reasons. 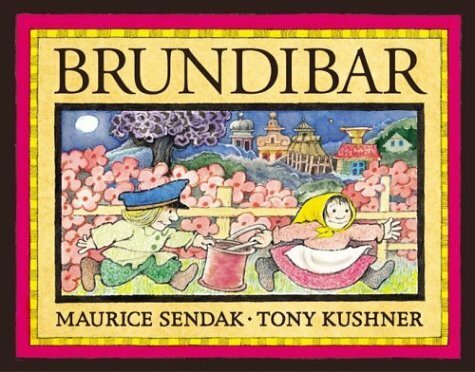 Maurice Sendak's illustrations, the storyline with the opera background, and of course the holocaust link- an area of interest which appeals to me very much. On a tangent- the review reminded me of the movie "The Great Dictator" with the caricature of Hitler by Charlie Chaplin. Thanks, Sunita, for this one. I thought I was hooked when I saw Maurice Sendak. Then come your intro, which blew me away. This is definitely a book I will share with the monkeys at home, if I can keep my tears under control that is. Loved both the reviews. Brundibar was especially so touching. Will see if our library has these 2. We've enjoyed Maurice Sendak through "The Little Bear Treasury"! Can I say "Aninku and Pepicek" are adorable names, first off:)And what a whimsical way to present the msg...nice! Sunita...thanks for this pick ! As Meera pointed out, I loved the quirky names (thought may be it is a combination of the 2 people - author and illustrators' names :-)). Yeah..a big fan of Maurice Sendak...would love to get hold of this book and read to the kids ! Oh, sounds like a riot! Where the wild things are and Little Bear have been our favorites as well, like many. Sounds like the goofy sisters in the household will enjoy the goofiness galore aspect of it. Mamma likes the message for sure. Nicely reviewed, Pops! clever messages masked inside a delightful book, and you've peeled off the layers just enough to entice us. thanks for sharing with us! @CA: That it is! And thanks so much for all your active participation on ST! @Sandhya: Have read Where the wile things are but not the other two - didn't know there was a trilogy. Little bear yes, we have a Kiss for Little Bear - very cute. Agree about the sinister bits too! @UTBT: I know - I was so so sad. 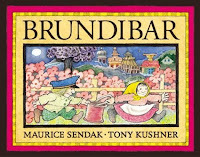 And apparently Maurice Sendak heard the opera and was so moved that he wanted to make a book out of it. @WJ: Thank you thank you! @Praba: Oh the goofy sister number one has devoured this book. And still devouring. Little one can sing all the songs in it! @Kodis mom: Thank you! Am glad I could convey atleast partly what I absorbed.